﻿Ok, I am going to admit that I am a lettuce snob. I can’t help it; we grow so many kinds that anything else is just no acceptable. 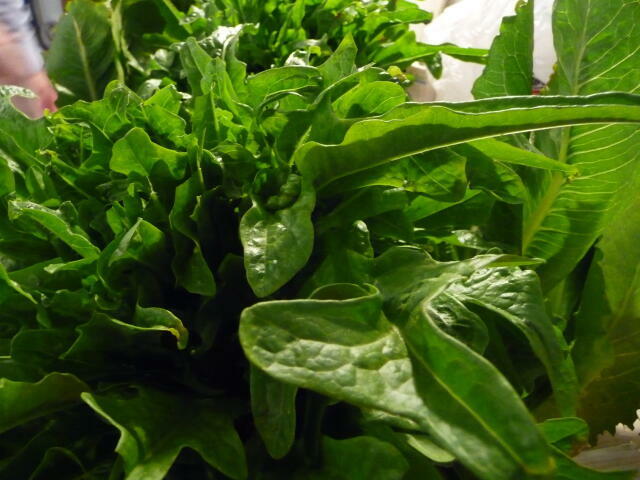 Right now, I am inundated with all kinds of lettuce from Freckles, to Romaine to Oak Leaf, Quattro Stagione and many others. I do not grow iceberg and truth be told, the greener lettuce is, the more nutritious it is, so if you have looked at iceberg lettuce lately, it just does not measure up. A fresh, crisp salad is a staple for dinner and I serve it after the main course, as do the Italians and the French. Very cool, Barbara; thanks of sharing! I like having both lettuce and spinach in salads. I think they both taste delicious and, would give such wonderful flavor to any kind of homemade salad you make. Also, when if you add a salad dressing on top either Ranch or, whatever dressing you like, I guarantee you would enjoy all the different flavors from that as well. I lobe using romaine as a vessel for chicken and tuna salad.